A mobile version of the well-known Carmageddon racing series, famous for its grotesque, over-the-top violence and black humor. This game was produced by the original creators, i.e. Stainless Games. Carmageddon: Crashers is different from the core installments in the series. 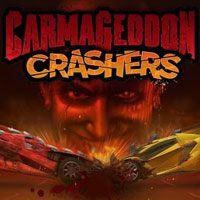 Carmageddon: Crashers is a mobile racing game released for AND and iOS, which is a variation on drag racing. The title is based on a free-to-play business model with microtransactions, and was developed by Stainless Games, that is is the team responsible for all other installments in the series. This game is much different from previous Carmageddon games. Instead of traditional racing we get an unusual version of drag racing. In Carmageddon: Crashers the participants start from the opposite sides of the track, and rush their way forward until they run into each other. The speed and stats of their cars determine which one wins the crash. This idea is quite original, but the gameplay itself is not much different from what players know from other mobile drag racing games. This means that the player does not get full control over the vehicle. Cars must always drive forward, and your job comes down to shifting gears at the right time and slightly adjusting the course. The game offers loads of cars to unlock, and each one of them is highly customizable – you can mount better parts and chage the vehicle’s appearance. The player can also use a variety of gadgets – some of them may help you survive the crash, while others will decimate the crowds, thus granting you extra points. Another important feature is the sponsorship mechanics. Carmageddon: Crashers fir AND and iOS can boast attractive 3D graphics. Both maps and car models feature high level of detail. What adds to that is the characteristic atmosphere full of black humor.